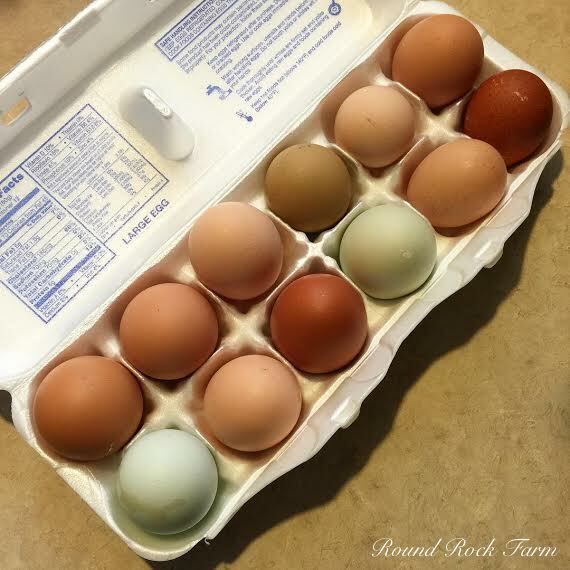 One only has to look at the beautiful eggs laid by various breeds of hens to be enamored by their unique color palette. 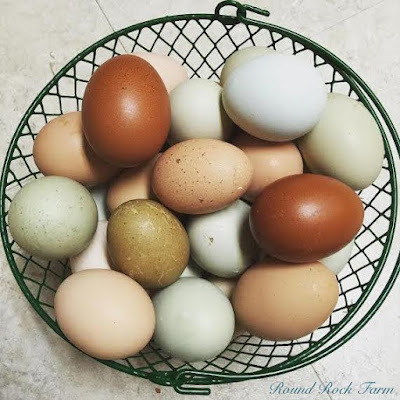 I've been closely following on instagram, the photographs of eggs and hens taken by a couple in Russellville, Arkansas who run Round Rock Farm, because I find inspiration in their passion for farming and raising free-range hens. 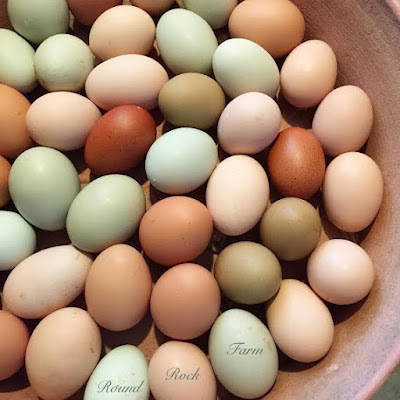 What's more, the calming hues and tones of the eggs which get laid by the dozen on their farm are in themselves works of art. This is the type of earth-tone palette that I love to no end, because it is subtle in tone, soothing in its rich shades of blues, greens, grays and browns, and because it is delicate. I have to admit that I tend to buy out the eggs at the stall whenever I find any of these at the farmers market. The husband and wife team that run Round Rock Farm practice free range husbandry with their beautiful flock of birds, and incidentally, they even name many, if not all, of these beauties. From Lilac to Dixie, Tiny to Virginia, the girls seem to be prolific this summer and the photographs prove it. It's wonderful to see the chickens feasting on big wedges of watermelon, chopped up cucumbers and other vegetables. 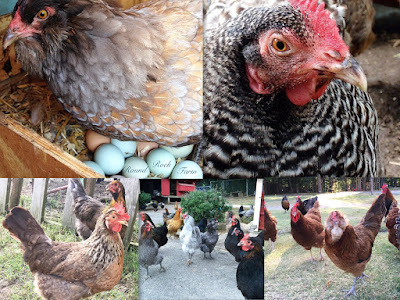 It not only contributes to their happiness and well-being, but their rich & diverse diet of this and high-quality feed, make for the freshest and best tasting eggs when they go to market. A tall, regal rooster is going about his business at the farm. 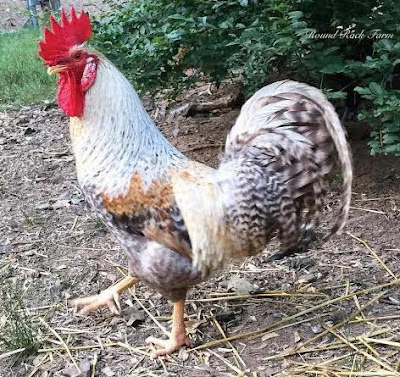 Look at this beautiful rooster. 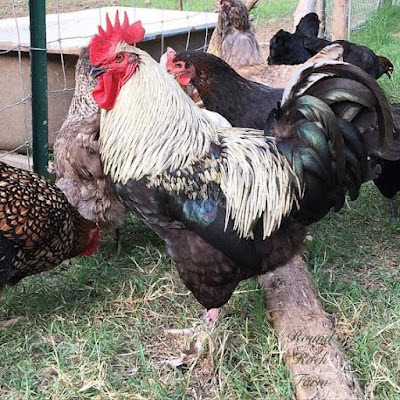 His plumage is simply amazing, and from the flock of hens surrounding him, it seems like he's very popular. The eggs which come from Bantams, Blue Copper Marans, Cinnamon Queens, Easter Eggers, Wyandottes, Ameraucanas, cream-colored Legbars, Araucanas, among others, get collected, washed and prepped for selling at their local farmers market every single week during the summer. A packaged up dozen of mixed-breed eggs is ready to be sold at the market. Don't you wish we could all have eggs like this all the time? If you happen to visit the Russellville Community Market in Arkansas, don't forget to stock up on Round Rock Farm natural body products. 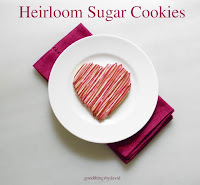 A line of earth-friendly, high-quality products, such as lotions, soaps, bath bombs and lip balms are produced in small batches. 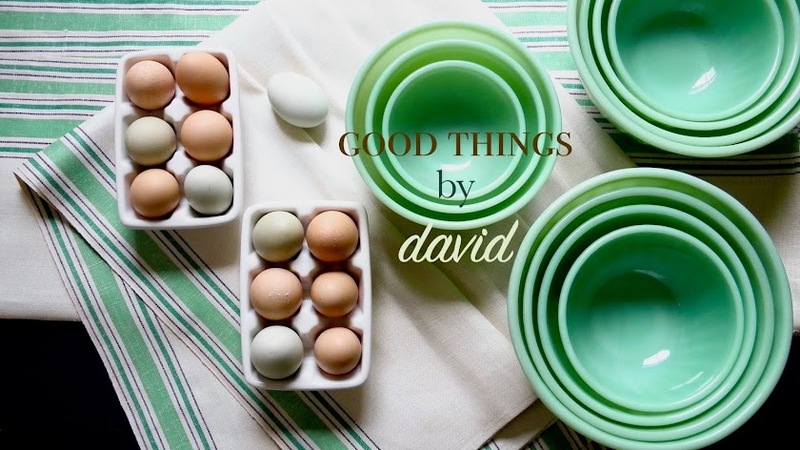 Look at the amazing palette of eggs in this large bowl. 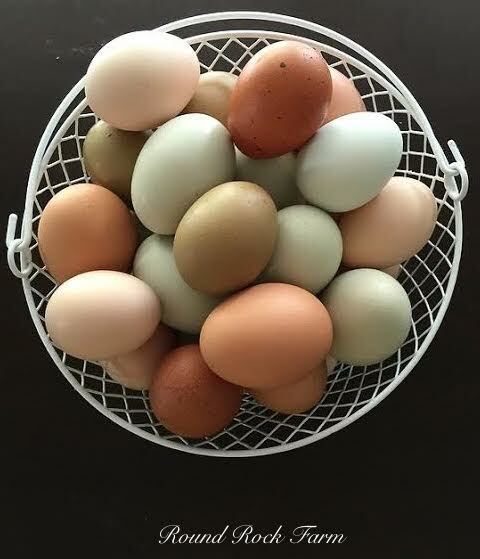 I'm drawn to the pale aquas and olive green eggs, but the dark, almost chocolate-colored maran eggs stand out among the crowd. 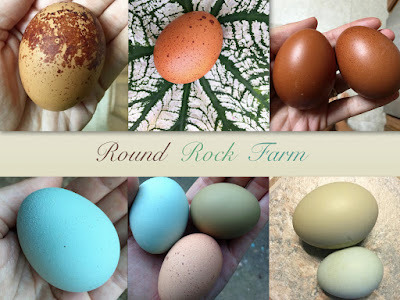 Speckled eggs do occur from time to time. For you crafters and decorators, a collection of these eggs blown out with extra care can be used for a variety of occasions. If you like this color palette as much as I do, I would take it even further and try to have custom-matched paint made to order from a local paint dealer. 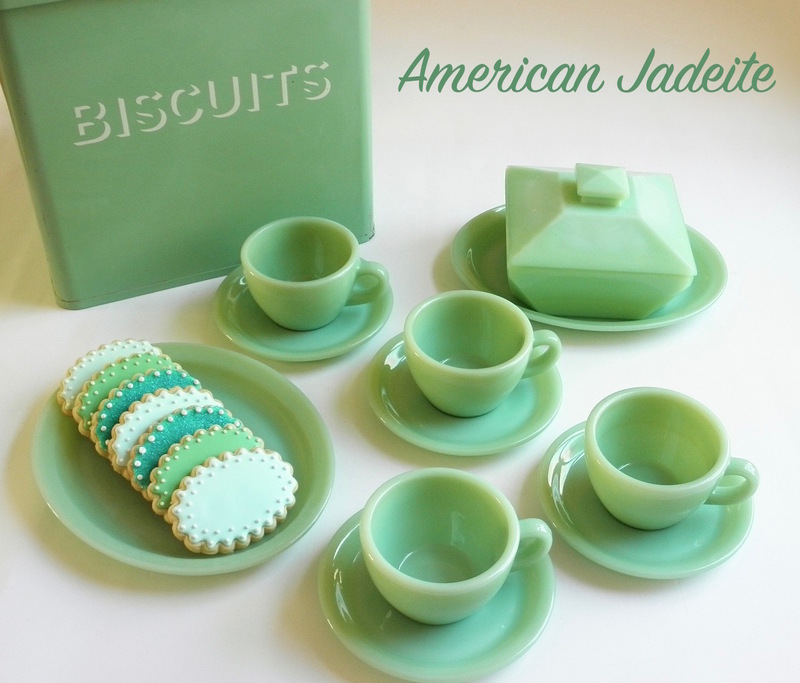 Imagine what a set of rooms, a hallway, a powder room, mudroom or laundry room would look like with these colors. That dark olive-colored egg on the top left would be spectacular on Shaker-style kitchen cabinets. I want to thank the family at Round Rock Farm for letting me post these photographs of the eggs that come from their five acre farm. 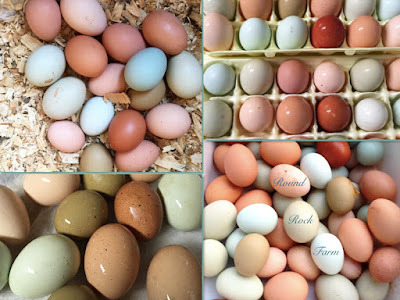 You have inspired me to one day keep a variety of layers for their naturally beautiful eggs. I could really get used to having eggs like this in my kitchen every single day. 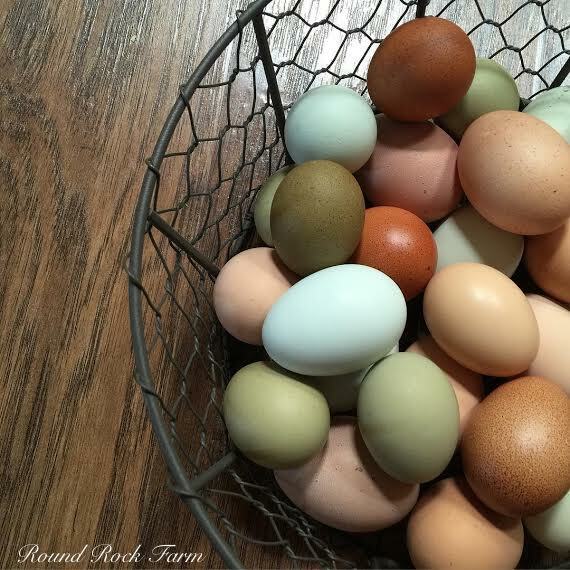 If you're on instagram, make sure to follow the user: roundrockfarm.